The events of Dec. 6, 1928 in Ciénaga, Colombia, would inspire a famous novelist, topple a government and change the dynamics between a massive corporation and one of the many countries it operated in. The massacre took center stage in Gabriel Garcia Marquez‘s 1967 masterwork “One Hundred Years of Solitude.” The recently deceased and monumentally lauded writer said he was inspired by the stories his grandmother told him about living in the Magdalena region of Colombia on the country’s northern coast, known as the banana zone for its main agricultural product. At the time he wrote the novel there was little interest and no serious historical studies on the banana workers’ strike that began in November 1928 and culminated in the massacre the next month and subsequent crackdown by the government. As soldiers looked down from their machine gun nests along the building surrounding the square, the crowd nervously milled about. The workers’ demands from United Fruit were far from unreasonable — a direct contract with the company, six-day work weeks, eight-hour days, medical care and the elimination of scrips (only good at company stores) that were paid to the workers instead of cash. Ten years earlier, the company’s workers had gone on strike with similar demands, but had failed to achieve their goals. The term “banana republic” stems from the sometimes interventionist policies of the company in regard to the many countries where they did business, especially in Central and South America. One of the most blatant of these interventions happened in 1917 when United Fruit and its rival, Cuyamel Fruit of New Orleans, pitted Honduras and Guatemala against one another over disputed territory that the two companies also happened to be wrangling over. By 1928, United Fruit owned more than 220,000 acres of prime Columbian farm land, with much of it not under cultivation, and held a lot of pull with the central government. When the strike broke out the government sent about 700 troops to quell it. There is still a question on how much, if any, influence United Fruit had on the decision to send in troops. A series of cables from American diplomats to the U.S. State Department shows they were in close contact with United Fruit representatives at the time and that there were discussions of sending American warships to the area because the nature of the strike was changing into one with “subversive tendencies.” An American ship was sent to the area, but the U.S. ambassador said it was non-military. Government officials in BogotÁ¡ were frightened by the possibility the strike was the start of a full-fledged revolution and the possibility of American intervention. This was likely drummed into General Cortes Vargas’ head. The strike was building into a larger movement, gaining support from local planters, townspeople and the press. Jorge Eliécer GaitÁ¡n, a congressman with the Liberal Party, rose to popularity when he railed against the government’s killing of the strikers and their families. He toured the banana zone and gave speeches in person and on the radio painting the Conservatives as puppets of American business. During a speech in Colombia’s lower house of Congress he held the skull of a child who had been killed by the Army. 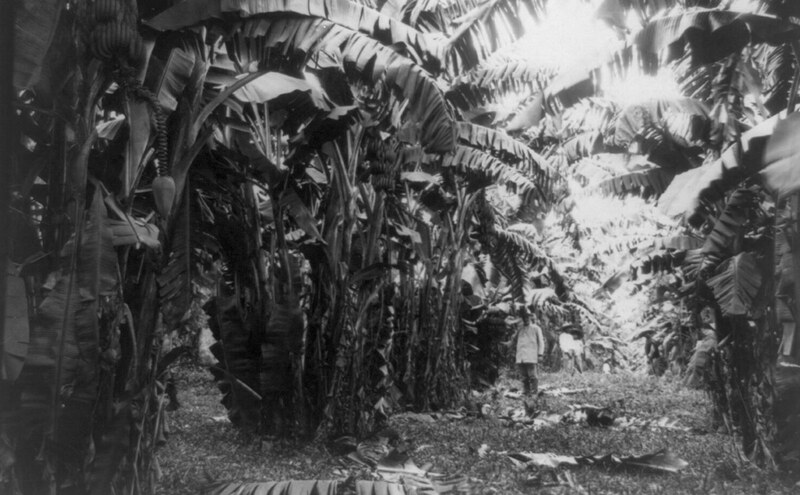 Man standing in grove of banana trees, Cuba, 1923. Photographer unknown, courtesy of the Library of Congress.